My last post covered the beginning of September, and this one doesn’t catch up to the present date yet, but goes up till the end of September. I accomplished a few changes to my town I’m happy with, like the moving of one of my character’s houses, and getting a new dream neighbor moved in! I decided I wanted to move Violet’s house to a new location (despite the fact that I’d made decent progress on it) because I felt it was too close to Estel’s castle, which has a long regal entrance. And then on the opposite side of this long regal entrance was Violet’s humble little cottage… it just seemed out of place. And I thought Violet’s house would be more fitting in a nook in the river by the town tree instead, since I’d like the area around the town tree to be like a forest. I’ve worked on the interior some as well, updating the main room into a proper kitchen. New badge! Wandering about in various dream towns can be very relaxing, I’ve been enjoying it a lot lately. I was short on bells (after spending so much on Violet’s house expansions) and didn’t feel like beetle hunting, so I harvested all my perfect apple trees and took the fruit to Bywater to sell (which has cherries as its town fruit, and the Bell Boom ordinance), and I made over a million bells! 😯 I hadn’t ever done this before because I didn’t want dead trees, but I was able to do this a few more times without any perfect apple trees dying! And I guess I shouldn’t let dead trees deter me too much, I can always plant more in their place. Finally Gracie shows herself! It seems like everyone else is much further along than me with the fashion checks (which you need to pass four of in order to get the Emporium). These are all considered post-impressionism, one of my favorite art movements! I like that there seems to be some organization to the exhibit. Lucky moved out recently, and I decided to put him up on one of those “adoption” sites for the first time. I’m hoping to maybe get some of my dream neighbors this way, so it feels right to also let some of my neighbors become others’ dream neighbors. A menacing scarecrow 😛 That reminds me, I unlocked the scarecrow PWP a while back, maybe I could put it (temporarily) somewhere in town to decorate a bit for Fall. I don’t think I have the time or energy to do a full town re-vamp for Fall (or Halloween), though. The town hall with the Autumn moon. When I caught up to the September Bug-Off — which I’d completely forgotten about — it was daytime in my game but nighttime in real life, so it occurred to me that I could go to Club Tortimer to catch some palm tree beetles for the Bug-Off. While I was on the island, I had my first social experience on Club Tortimer. Before, all the people I ended up on the island with were silent (or in a few cases, left once I arrived 😛 ), but Marilyn struck up a conversation and even invited me over to her town. In her town, she offered to give me some perfect pears! 😀 Pears get a bad rap in the AC community for some reason, but I think the perfect golden ones are beautiful! As usual, I won the Bug-Off… a bit ho-hum at this point. I’m happy that all the bushes I’ve planted here so far have grown! I might try to add a few more. Estel’s private hot spring! Though this was just me experimenting; I’m not sure if I’ll always have this hot spring here, because I think it could also go somewhere else. Maybe a fairytale bench could look nice here instead? Any suggestions? It’s right by the waterfall (where Violet’s house used to be), so it could potentially be a lovely little spot for a PWP or two. What I’m working on right now is resetting for Paula’s (who I managed to get a hold of recently) house plot to land in a good location. I’m being pretty picky about it since she’s hopefully a permanent neighbor, and I’m starting to wish that I’d spread out more PWPs across town for house-repelling purposes instead of aesthetic purposes. Definitely going to start focusing on that from now on, since it’s a pain to have to do the reset trick for this long. >_< Wish me luck! EDIT: After a good deal of resetting, I finally got her house landed in a good spot! It’s behind Colton’s house. I actually was hoping for it to be placed one space down, but that one space seemed too trivial of a thing to continue resetting for, especially since over 90% of the time, the house was nowhere near here. D: And I think this spot should be fine. Posted on October 11, 2013 by Amy •	This entry was posted in AC:NL, AC:NL WiFi, Citalune and tagged Animal Crossing. Bookmark the permalink. Congratulations on getting Paula so soon, and such a great location for her house! It really fits in well. Thanks, I’m glad you think so 🙂 I’m sorry I didn’t end up taking your Paula (that would’ve been cool), but I saw she was available recently and couldn’t resist. Oh, I thought she always gave exclusive furniture, she didn’t for you? I was hoping for something Princess-themed, but the sweets bed is cute too! Yeah, I don’t know why the requirements of building things near the plaza are so picky. 😦 I would’ve thought the requirement was two spaces away like usual, and where I planned for Violet’s house to be was three spaces away. I also tried to see if I could build a hot spring underneath the waterfall (which is near my town tree), but she said that was too close to the plaza as well. I’m guessing the requirements for building things near the plaza is four spaces away. Sure, I’ll let you know! 😀 I don’t plan on her being a permanent neighbor, but hopefully she sticks around for a little while. My dad didn’t want her to move out in the first place, so it’d be nice if she was still around in some form, especially with someone I know instead of a stranger from AC:NL Adopt. 🙂 The exterior of her house doesn’t match well with my town, but it isn’t bad-looking or anything. It’s red, so it might look especially nice in yours! The only problem is the interior of her house, lol. My dad sells lots of random stuff to his neighbors at Re-Tail so it’s really messy. I’ll try to fix it, though! Lol, the day after I wrote that about Gracie, surprise surprise, you know what happened 🙄 It was a sweets chair 😛 Maybe she only gives you what’s in season. Yeah, I’d guess that too. My dad got a Gracie desk at his first fashion check, but that was back around summer-ish, I suppose. Really? I’ve never seen anything come out of the clock o_o I’ve waited to watch it at the turn of the hour, too, I guess I’ll try again and pay closer attention! Haha, I’m sure she’s not programmed to follow you more than other characters are. You can believe whatever head canon you choose to believe, but in official Animal Crossing canon, Paula is a female character. The Uchi characters are all female, and Paula is a girl’s name. Good job with getting her to move out of your town! But she is still in mine, and I like her, so I’d appreciate if you refrain from leaving more negative comments about her on my blog. okay, but i dont know why the villagers keep saying “he” then. Oh, Paula left my town today, Yay! Since sometimes, when villagers move out of a town, they move in somewhere else , so keep an eye out for Paula. I hope you enjoy time with her! 1. would you like me to post it so you can chop those trees down? 2. would you go to my dream town and chop all the trees down too? Thanks for taking the time to do that! But I’ve done some testing on this and learned that each tree is not ‘destined’ to produce a certain marking. Depending on what kind of axe you use, when you chop down a tree, it has a chance of being a non-marked stump, or a variety of different marked stumps. Regular axes and golden axes produce marked stumps rarely, but silver axes always produce marked stumps, so I recommend using the one I gave you if you want some special stumps. 🙂 And if you really want a specific stump in a certain place (and don’t mind kind of “cheating” a bit), you can save the game, axe the tree down (with a silver one), see what kind of marking it has, and reset and try again until you get the marking you want. 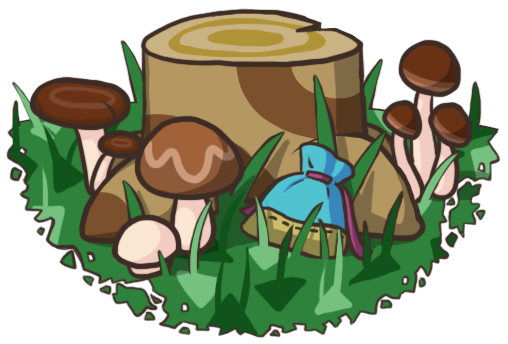 Another thing to keep in mind is that the possible stump markings vary depending on what kind of tree it is. i can finally dig out the tree stump that has been annoying my paths, put it somewhere else. Thanks! Amy, I need you help fast. I know you know this sort of thing, so i’m asking you. There is one of those boarded areas, and pewees trying to move in. I want to prevent that, but I don’t know how. Please help.. And fast! You can’t prevent it at this point, I’m afraid. The only way you can control the villager and/or house location is by loading a new character on a day you’re expecting a house plot to show up. If the villager/house location is to your liking, you save the game with the new character. If the villager/house location isn’t to your liking, you reset and load again with a new character, and so on until you’re satisfied. But if you load the game with a character that already exists (ie. your mayor character), there is no going back. oh.. I guess i will have to make him move. Wow – I would be so angry about Violet’s house! Also wow about your kitchen! Looking really good! ^ ^ We need to get together soon! 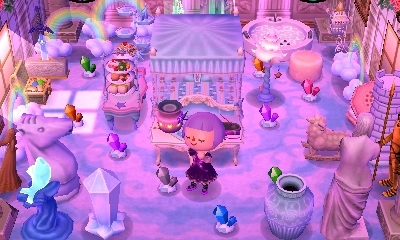 I have lots of blue and alpine furniture chilling on the ground in my town for you!! OMG the adoption center is an awesome idea! I had no idea it existed! Dream villagers would be so easy to get!! Aww, I had a chance to get Phoebe recently, too! Though, I had 10 people when she camped in my town, so I had to say goodbye, but that’s just my luck these past few weeks. 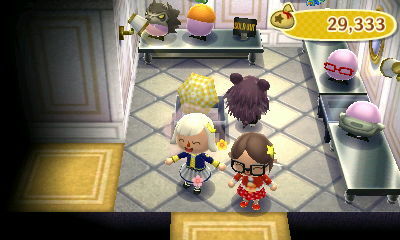 I’ve even had GOLDIE camp in my town! She’s like your MELBA!! My favorite Animal Crossing character ever, and I had to watch her leave the next day. 😥 I was SO mad, but I’m sure you’ll hear about it in an upcoming post on my blog. ;)I just hate that you don’t have any control when your town’s full and someone you like camps for the day, you know?! I was angry at first, and I’m still a bit bummed about it 😦 But hopefully I can still make the area around her house a nice forest-y part of town. Oh yeah, I definitely am too! D: I’ve hardly fished or bug-catched at all lately! Part of it’s just laziness/time constraints, and wanting to focus on other things, but another reason is grasswear… I’m trying to clear up dirt patches, and running around trying to catch bugs, and walking lap after lap around the river, would probably do a lot of damage to my grass. Awww, I’m sorry 😦 I don’t have the campsite, but I’ve heard that can be such a disappointment! I’ve even heard of people not checking the campsite at all when their town is full, so they don’t even have to know what they’re missing out on. Also, I don’t know if you know this already, but you can do the same reset trick that you do for looking for house plots with looking for campers. You can start up your game with a new character, check to see if there’s a tent (there won’t always be one), and see who’s inside. If you don’t like them, you can reset and try again. But that’s probably too much trouble, hehe. Hope she moves out soon! Some of my neighbors are strangely reluctant to move as well, like Robin who’s been here since day 1.